Very nice equipment and video work! I especially like the air and EGR in system. My one concern remains about the large reservoir of charcoal and having a positive containment/airtight way to shut it off. The SST bucket, future auger feed would make a good chimney effect. It needs to be spring loaded to close. Very well made, and liked the walk around explaination.Good luck with the result in leak proff pop off and auger system.you allso could mount on light weight trailer shed till find the best vehicle too mount too. We want to see it dirty now! Thanks Michael, the Stainless steel pale is just temporary to close the hole. Not sure how yet but that will be a puff/release fill valve there, still working in it. The hopper will not have air in it. I will be installing a air vacuum fan to remove the air out of the hopper to prevent hopper puff. Well thats the plan. Thank you, It is big for sure, about 90 gals WAG for the hole system. The lower burn area holds 18 gals. of charcoal, I am hoping I will not be able to over pull it with WOT going down the road. I have not filled it to top yet for a more accurate measurement. Thank you, To make a auger that will close off and not leak air is going to be a challenge. I have some ideas that I am working on. A trailer is a good idea for testing. Getting all dirty is the plan Don, ha ha. I got pretty dirty loading up with charcoal does that count? Here are two more videos for all you DOW Charcoal fans. First one is the light up. The second one is the flaring and checking for hot spots. Hope you enjoy watching the Bloops, it only happens when you are making a video, Right. Looking good. I cannot watch too many videos or all my data will be gone. But, what I see is outstanding! Thanks for the video Mr. Bob . Looks like you are making good progress ! Pretty sure I could find a spot for that on my tractor. Nice working unit BOB, your getting a handle on what too change, I think I could pull that behind a geo metro and save a lot of charco.Then i would look like a cheap set of wheels. Something easy on fuel anyway. I notice some water dripping from the connection pipe to the suction/blower when removing it. 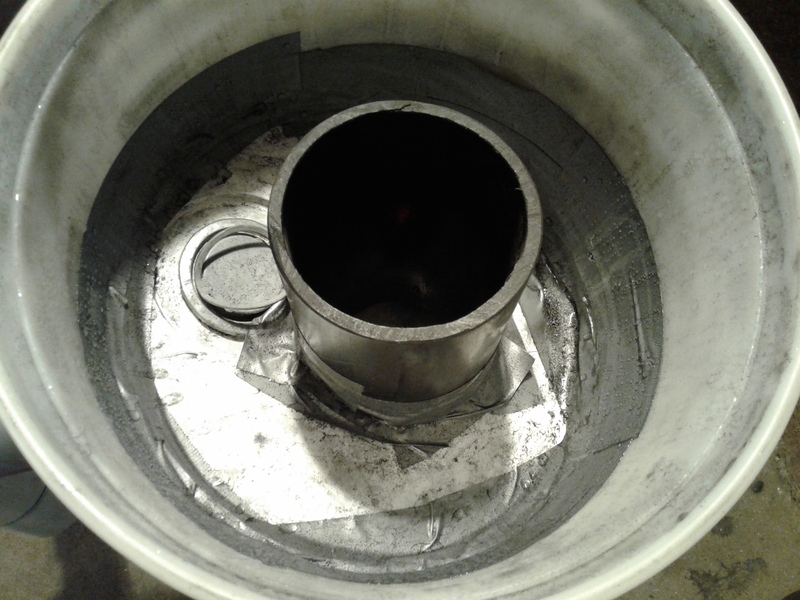 So I pulled the filter off the gasifier and took into the warm garage to check things out in the filter buckets. Water condensation in the upper bucket. Filter bags are doing their job, fantastic. @KristijanL Thanks Kristijan for your idea. 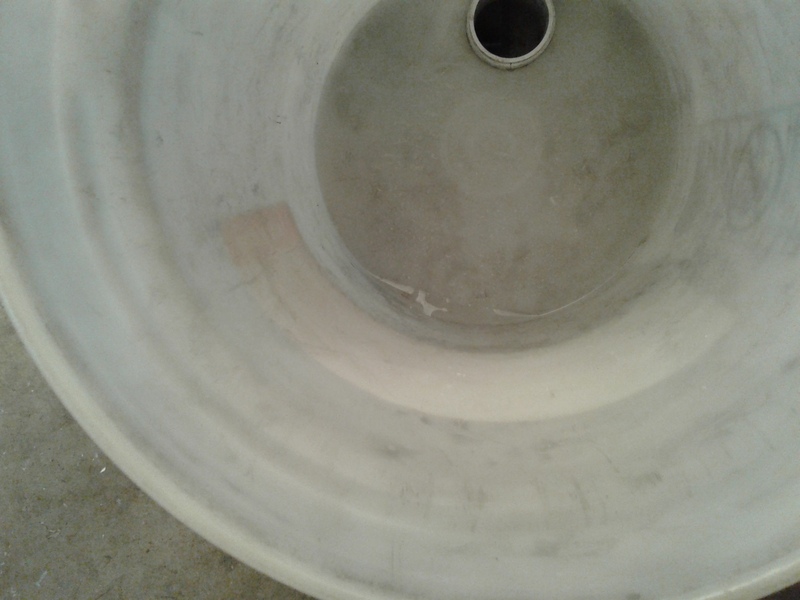 Water and char dust is collecting in the upper part of the lower bucket. Down in the lower part of the bucket even more water and char dust being collected. Conclusion is no need to add any water at this time, there is a abundance of moisture in the gas flow. I love it when random parts all come together in a useful setup. Also I like the artistic looks of your creation. It reminds me of a cartoon from the 70s called “Professor Baltazar” I think it was French. I don’t know if it ever made it across the pond. Now, let’s just hope a suitable vehicle turns up. I can’t wait to see one going down the road power by your machine. great to see your flare! 1: If I remember it right, you said in the video that your charcoal is a bit wet. With the cross-draft design, it is possible that steam and pyrolysis gases from drying the char above the reaction zone bypass the reaction zone and go directly to the gas outlet. This is why you need good tar-free and dry charcoal. Thus, if your char was a bit wet, it might be the wrong conclusion that all this water passed the reaction zone unchanged. 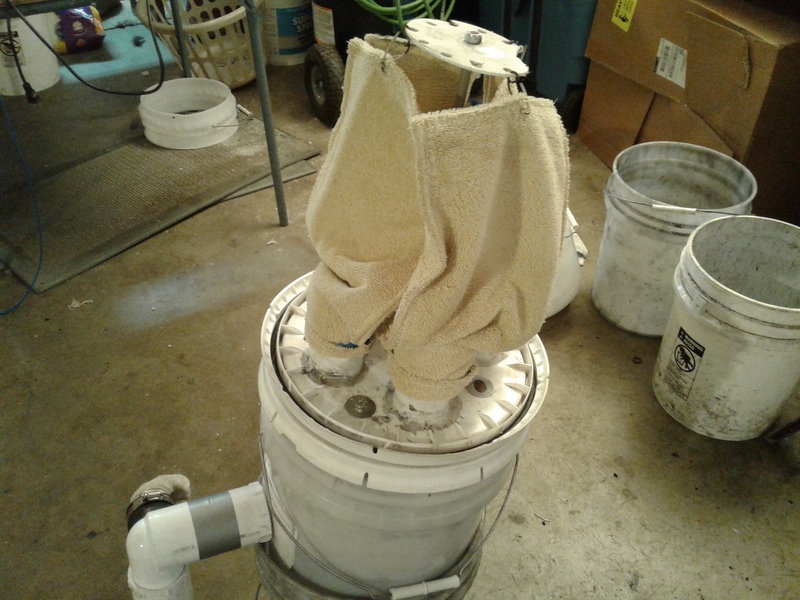 2: If a cloth filter becomes too wet, it tends to clog. Or the flow resistance increases much more than with a dry filter cake. To avoid this, some old WW2 designs had a bypass of the cooler to keep the filter temp in the range of about 70° Celsius. This is high enough to avoid condensation in the case of relatively dry charcoal gas and low enough to avoid damage to the cotton filter fabric. Looking good Bob! I am wery interasted how your nozzle holds up. Just a note. Your truck was idleing on petrol when you run those tests right? Petrol exhaust contains lots of water vapor in contrary to chargas exhaust wich is only composed of CO2 and N2. Your gas composition will change once you run a engine on pure chargas and run its exhaust back. The water will be gone. I am actualy at a point here on my Mercedes where l have less mousture l wuld want, using just EGR. Damp or slightly moist towel sacks do a much better job of collevting dust thain completely dry ones. I have seen wery light dust in my pipes after the filter. 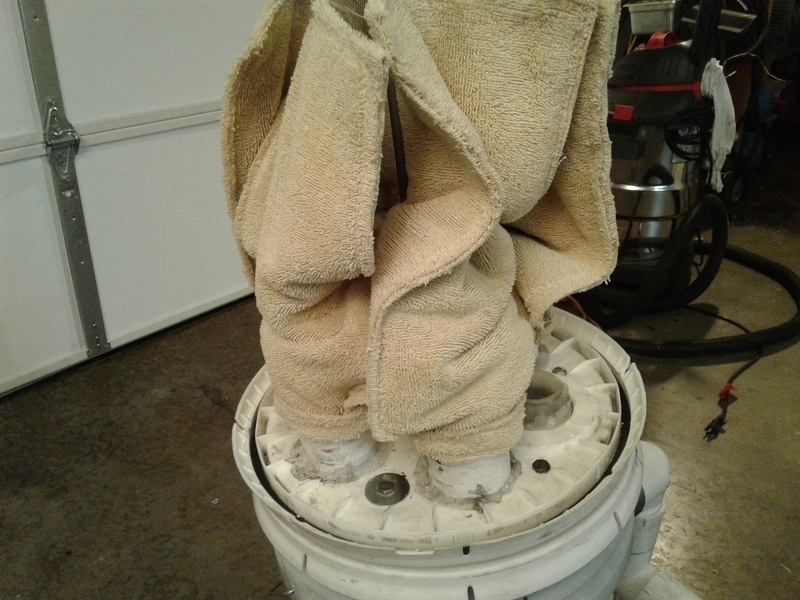 If l stay with useing EGR only, l will have to add a final oil filter or uses tighter fabric, l eaven thod of squirting a occasional squirt of water in the gas before the filter, to wet the sack. Ha, l remember Proffesor Baltazar! You are spot on JO had to look on wikipedia, had no idea its actualy a Yugoslavia cartoon. good point with the moist petrol exhaust! And with the towel filter: So the point is to keep them damp but not too moist (like in your Chevy) to get the best results, right? Thanks for the information, my charcoal has probably picked up some moisture from being in the container, but the stuff that got rained on was not used in my gasifier for the test run. 70* Celsius or 158* f that is good to know. I will be placing temperature gauges on the Gasifier as soon as they come, found some that will blue tooth to my pad. It sounds like one should go in after the cooling rails so it can be monitored. Good point on the exhaust from my truck running on petrol. 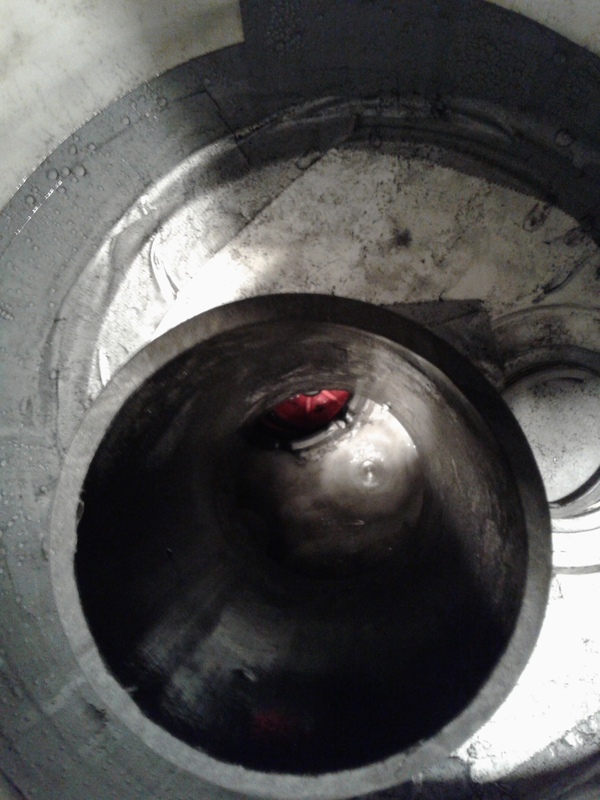 The water was continue dripping from the truck tail pipe and it ended up in the pipe going to the gasifier. Some of the condensation could have been from moving the unit from warm garage to cold outside, but I think the wet exhaust is part of the condensation problem showing up in the filter container. At the end of the run the socks were very little dampened by moisture. I also member putting my hand on the filter container and it was warm durning the run. The nozzles, you and me both are anxious to see how the nozzles are doing and also my heavy duty plate above the nozzle lobe path. If it will work it will be come my water vessel to make steam for the hot dry summer days we have here, very dry climate at times. The oil bath filter is a good idea. I love the oil bath filter I had on my old 1965 International jeep. Lots of fun going on at Bob Mac Place.